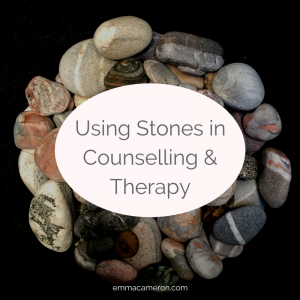 How Do Therapists Use Stones in Counselling? If you’re a counsellor, psychotherapist, or Art Therapist, chances are that you have gathered together a nice little collection of attractive and interesting stones that sit in a little basket or bowl somewhere. Perhaps you’re wondering about finding more ways you could use your stones in counselling with your clients. Stones, which of course literally come from the ground, are great for helping a client practise grounding – coming back to the immediate here-and-now – when feeling overwhelmed and dysregulated. With your client holding a stone, invite them to use words to describe the phenomenology as they experience it: the stone’s texture, colours, shape, size, weight, asymmetries, temperature, etc. An extension exercise might be to invite them to expand their focus to include awareness of the effect of gravity on their body and the stone. 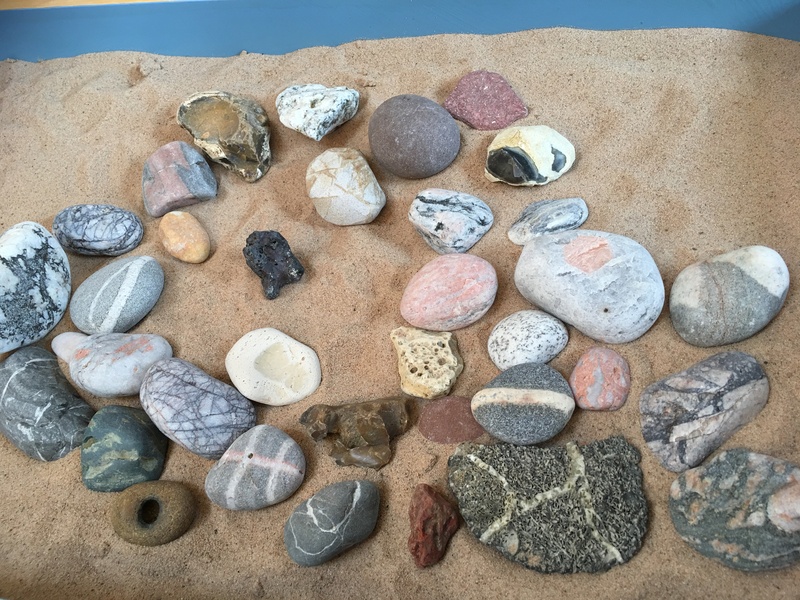 A relationally-informed mirroring/ attunement approach in which client and therapist sit on floor cushions with stones and sandtray can effectively help a hypo-aroused or hyper-aroused client return to their ‘window of tolerance’. Simply arranging stones without any plan or particular intention, can lead to interesting and unexpectedly deep work. (This can be particularly the case with HSP (Highly Sensitive) clients). You might invite the client to allow their intuition to guide them in creating an arrangement of stones that feels satisfying to them. This may spark discussion about their experience of process, and how it feels for them to allow their felt sense to lead. Can they let their ‘inner critic’ step back so that they can play freely? What do they notice happens when they do this? And how does it feel to ‘play’ in the presence of an attuned other (the therapist)? A client who is used to more left-brain, outcomes-oriented approaches may find this new perspective – this new way of conceptualising how to be in the world – quite illuminating and even transformative. When a client begins without a plan or intention, and simply creates a satisfying arrangement of stones, themes may emerge that seem to come up from the deep unconscious. It’s a bit like free-association or dreamwork. This can bypass the familiar, well-worn paths characteristic of rumination. Space is created for authentic felt senses to lead to fresh perspectives, links and insights. In other words: we get into ruts and habits of thinking, where the same thoughts churn round and round, washing-machine style. Being creative without any outcome in mind, and then exploring what that’s like – and finding words to communicate this with someone who is deeply attending (the therapist) – can shift us out of the habitual thinking-patterns and into something new and fresh. This can help us get clarity and new ways of understanding what’s going on for us. When a client does choose a ‘me’ stone, you can begin together to unpack what attributes they may have projected on to the stone. There are many ways you can go with this; for example, one stone might represent ‘me when I’m feeling confident’, another ‘shy me’, whilst another might be ‘my anxiety’. Besides exploring self-states, a client can consider what other attributes they sense in their ‘me’ stone. What does its relative size suggest? How about its shape, colour and texture? Keep in mind that projections on to objects in therapy can be intense and powerful. An exercise like this can evoke difficult-to-manage emotions such as shame, risking decompensation, so be careful about grading therapy experiments according to the ego strength and needs of your client. Successful psychotherapy, says Allan Schore, always involves communications between the right hemisphere of the client’s brain and the right hemisphere of the therapist’s brain. Schore also reminds us that communication between conscious and unconscious processes are always mediated via the right hemisphere. Working with arts and play materials, such as stones, allows the right hemisphere to become more central, and thus frees up brain/ body pathways for information and energy to flow, helping unblock the stuckness that may have brought someone to therapy in the first place. 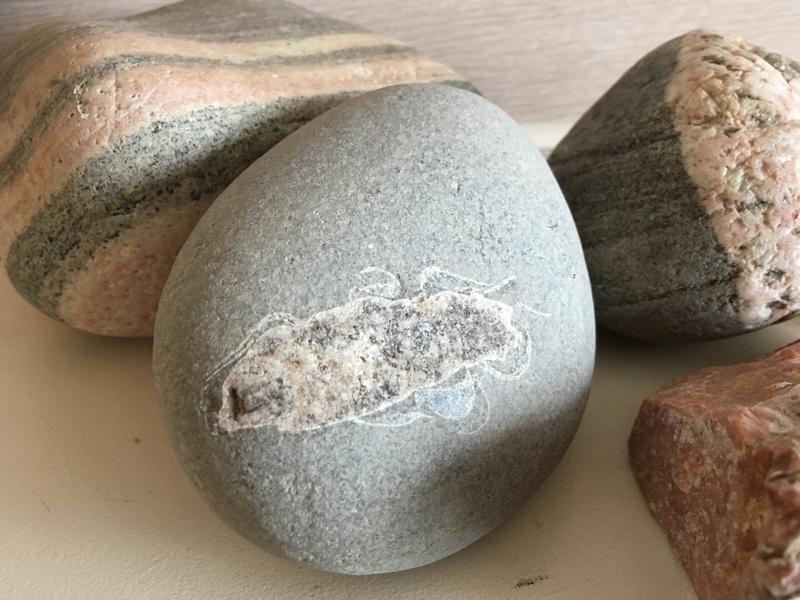 “This stone feels like your skin feels when you’ve been swimming in the sea… smooth but also a little bit rough, and that faint stickiness from the salt and sand” said my client Tina*, thoughtfully. Her voice slowed as she connected with body-based memories. Transporting us both through her evocative words, to a beach that she knew well from childhood, Tina got in touch with a deep felt sense of peace and pleasure. We were subsequently able to use this multi-sensory image as a resource in helping her heal from a trauma dating from her teenage years. Many people find that when they hold a stone and take some time to allow it to have an effect on them, memories from earlier in life emerge spontaneously. These may be pleasant and nurturing memories (such as Tina had); but it’s important to be aware that stones may equally evoke memories associated with traumatic events including bullying, accidents, and assault. When the trauma-based associations can be carefully untangled in therapy from the benign ones, a client can become freer to enjoy the supportive pleasures of nature once more. 7. Where Am I in Relation to Others? After they’ve selected and arranged a group of stones, you might invite your client to imagine that these stones represent their social group (or their family, or people at their place of work). How do they feel the arrangement needs to be reconfigured, when they see things in this light? Where is the client’s ‘me-stone’, in the arrangement? Are they on the edge? In the middle? Who is the largest stone? Who is the smallest? Does anything seem unfair or troubling in the constellation? When Tina did this, she noted that the group was swirling around in one direction. She explained that her ‘me-stone’ was happy to follow along with the others, but she also realised it needed to be pointing in a slightly different direction. That led to a productive exploration of her sense of self in groups, and her fears and needs as they conflicted and merged with those of others. Many counsellors and therapists use genograms with their clients, to help clarify and identify wider family patterns and themes. Use of concrete materials such as stones, in conjunction with paper diagrams, may deepen and enhance the symbolism and learning. Rolls of cheap paper can be used to create a life timeline. The client can place stones along the line to mark particular moments of significance, including change-points, powerful emotional memories, etc. You or the client might take photographs to create a record of the work. Some clients, particularly in depth-oriented attachment-based psychotherapy, benefit from having a transitional object, taken with permission from the therapy room, between sessions or during therapy breaks. A stone can be particularly useful for this purpose, particularly if it’s small enough to hold comfortably and discreetly in the hand or pocket. The stone has no monetary value, yet it can hold enormous symbolic value for both client and therapist, standing as a reminder and token of the importance of the therapeutic relationship at this time in the client’s life. As one client said, the very fact that the therapist is willing to take part in the lending of the stone, and could understand the symbolic importance for the client in their (temporarily) regressed state, can be a large part of the healing power of this intervention. A client may choose a small stone to represent supportive qualities such as courage, resilience, love and strength. Carrying this ‘talisman’ around, they may feel that its energetic properties are an available resource that they can draw upon in times of need. For some clients, especially those with ‘art wounds’ (painful memories of being shamed or judged over their drawings etc), creativity can seem like something that others do but they cannot. For these clients, being flung full-on into painting or drawing can feel too intimidating, and even shaming. Yet a therapy that ignores the deep human need for creative expression is not going to help a client blossom into their fullest self. This is when natural materials such as stones can be invaluable. There is no ‘wrong’ way to arrange stones, and no ‘right’ way either. Stones can be handled and placed in various ways, and a client can be encouraged to tune in to their inner sense of ‘what feels right’. A client can discover that different configurations of stones may resonate for them in different ways. One client may feel deeply satisfied by arranging the stones in lines, or a grid. Another (or perhaps the same person on a different day) will respond to an inner urge to lay the stones in size order, or in a spiral or circle, or in clusters, or creating a design like a mandala or concentric circles. In this way, a client can develop a new relationship with their intuition and aesthetic senses, moving away from fear and judgement towards trusting their own inner guidance. Inspiring supervisors are always looking for ways to help their supervisees to view their work with fresh eyes, especially when a supervisee feels stuck or muddled around their work with a particular client. Use of arts materials such as stones in counselling supervision can offer a non-shaming, sideways way of looking at a therapeutic relationship. It can also offer a new way for a counsellor to conceptualise a client’s relationships and inner landscape. Acrylic paints and ‘Posca’ pens could be used for painting on stones. If you’re an Art Therapist you may have these available for clients to use during sessions. Outside of sessions, some counsellors like to paint words or statements on stones. Others paint images and symbols that might later be used alongside other objects in the sandtray. Don’t forget to seal the stones using some kind of varnish (advice on this can can be found online; always be mindful of toxicity and possible noxious fumes). There are many books, videos and blogs about stone-painting, and you can find plenty of inspiring examples on Instagram and Pinterest. When you use stones in counselling and psychotherapy, there are a couple of practical things to think about: what to make available as a backdrop or ground, and of course the all-important issue of sourcing your stones. A client can place the stones within a designated ground or frame, such as a sandtray, tabletop or large sheet of paper. This boundaried space is helpful for containment and building a felt sense of safety. Alternatively, both client and therapist may sit on a carpet, with the area between them forming the ‘potential space’. If you work with stones in counselling, do make sure you have thought about boundaries and containment, and how these themes play out in basic concrete terms as well as metaphorically, relationally, etc. Aim to amass a collection of rocks, stones and pebbles that is very varied and encompasses a wide range of sizes, shapes, colours and textures. What could be more relaxing and soul-nurturing than wandering along a beach, looking out for interesting stones? Of course, beaches vary, so keep visiting different ones when you can, and notice the different types of stones available in different places. You can also buy stones, pebbles and glass ‘pebbles’ in home-improvement stores, aquarium stockists, cheap homeware shops (like Wilko or The Range) and places that sell crystals and semi-precious stones. Let your family and friends know that you’re on the lookout for interesting rocks and stones, and maybe they’ll bring some back from their travels. Lastly: What have I missed out? 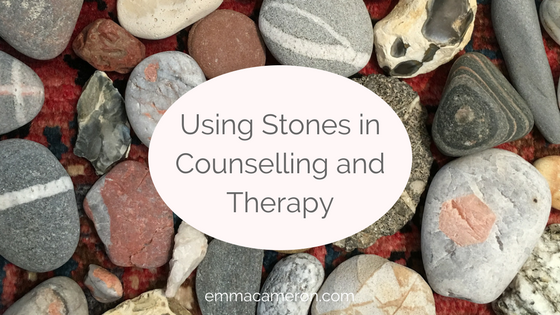 How do you use rocks and stones in counselling and psychotherapy sessions? What has your experience been? Do please leave your comments below!